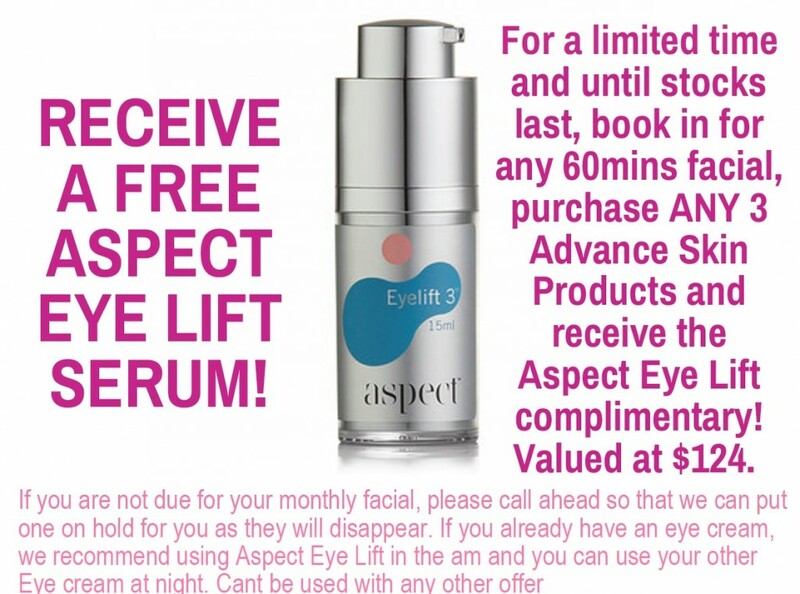 Receive a FREE Aspect Eye Lift Serum! Aspect NEW and improved Eye Lift is being compared to the best selling TNS Eye repair and has blown us therapists away! Aspect Eye lift is packed with Peptides, Vitamins A & C and E, Hyaluronic Acid, Shea, Olive, Jojoba and Aloe. This formula is non-greasy and works on puffiness, dark circles and lines. For a limited time and until stocks last, book in for any 60mins facial, purchase ANY 3 Advance Skin Products and receive the Aspect Eye Lift complimentary! Valued at $124.